Description: Domestic scene posed in backyard of home. 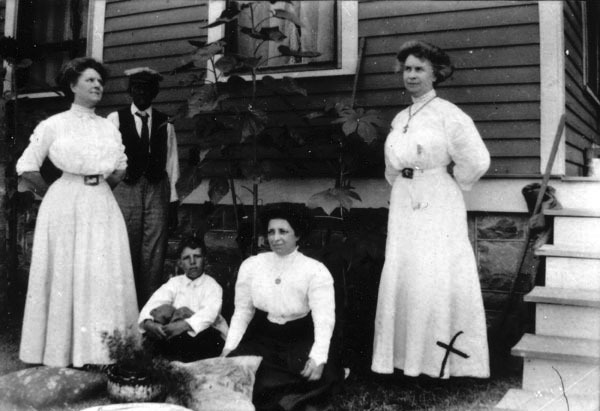 Group gathered around garden plants and houseplants. Woman on right identified as Mary Owens Thompson. 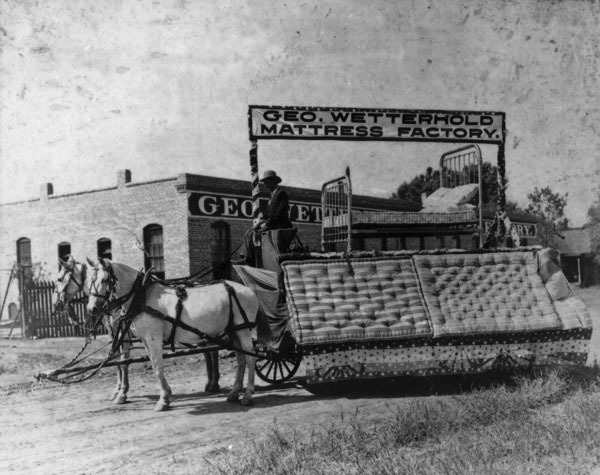 Keywords: Agriculture, people, residences, Wichita, household arts, fashion, child, man, African American. Description: View looking west on Douglas Avenue from intersection at Topeka. 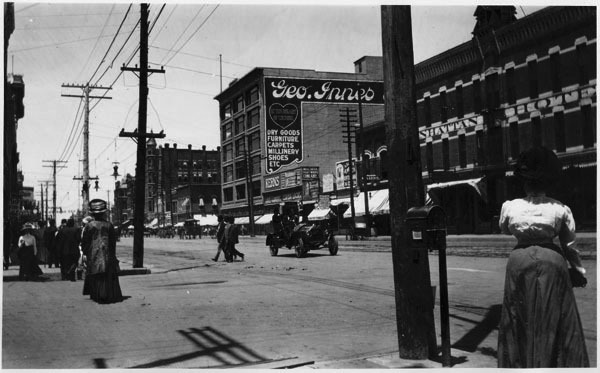 George Innes Company building at corner of Douglas and Lawrence (now Broadway) and Manhattan Hotel are prominent; Winne Building in the background. Keywords: Business and industry, people, street scene, transportation, automobile, fashion. Description: Interior of unidentified residence. Kitchen with various appliances including ironing board and electric iron and washing machine with wringer. Keywords: Residences, homes, domestic scenes, furniture, lighting fixtures, Wichita. Description: Interior of unidentified residence. 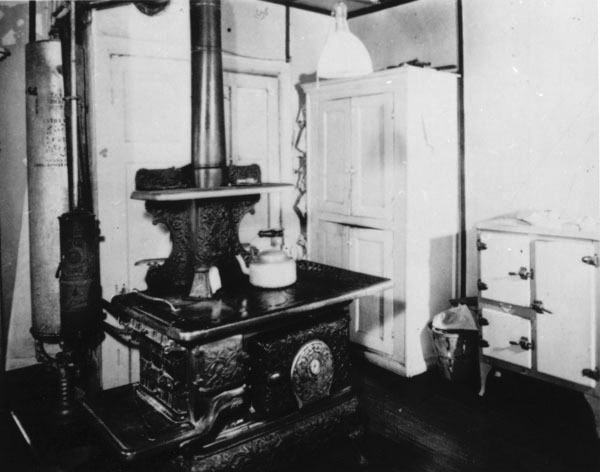 Kitchen with wood/coal-burning cook stove. Kerosene water heater is at left, icebox is at right. 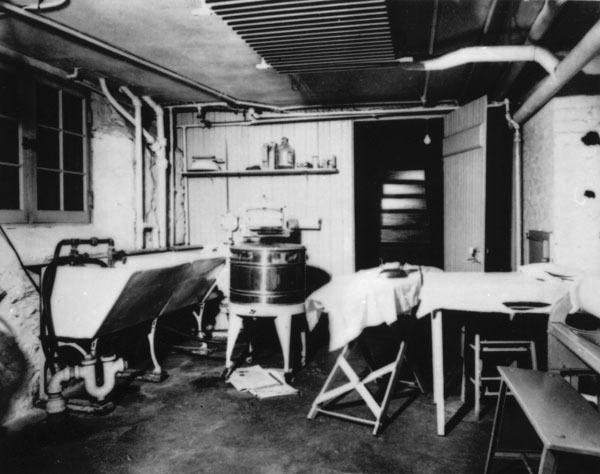 The metal object near the teakettle is a bread toaster. Description: Interior of unidentified residence, probably the basement. “Modern conveniences” include a washing machine and ironing board with electric iron. 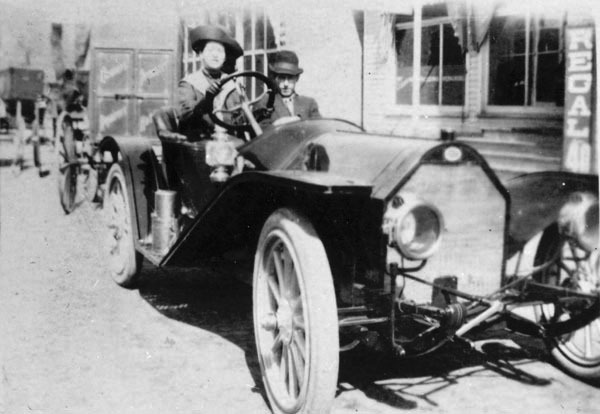 Description: Unidentified man and woman posed in an automobile. The woman is seated in the driver’s seat. Keywords: Street scenes, cars, transportation, Wichita. Description: Cornerstone laying for the Ark Valley Lodge, No.21, A.F. and A.M., located at 615 North Main. 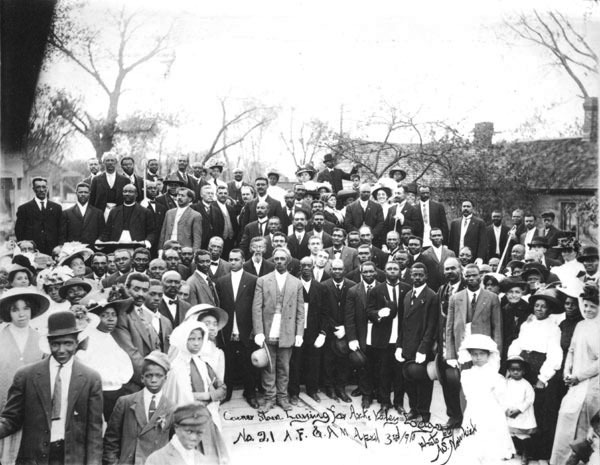 This photo was taken April 3, 1910. Keywords: Public events, African American, people, fashion. 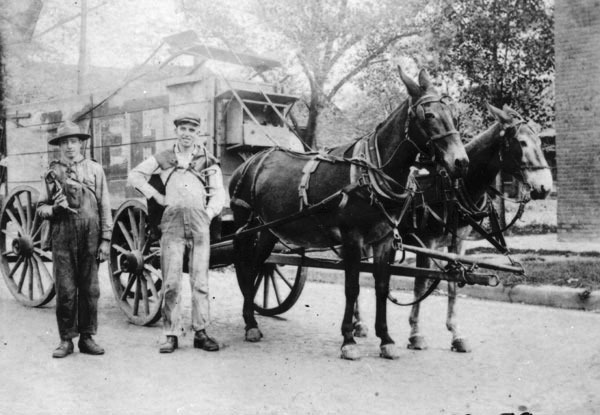 Description: Two young men posed with a mule-drawn delivery wagon. They are carrying ice tongs slung over their shoulders. One is identified as William E. Pratt. Keywords: Business and industry, people, public services, street scene, transportation, Wichita, employment. Keywords: Business and industry, people, public events, street scene, transportation, patriotism, bunting, 4th of July, bed, Wichita. 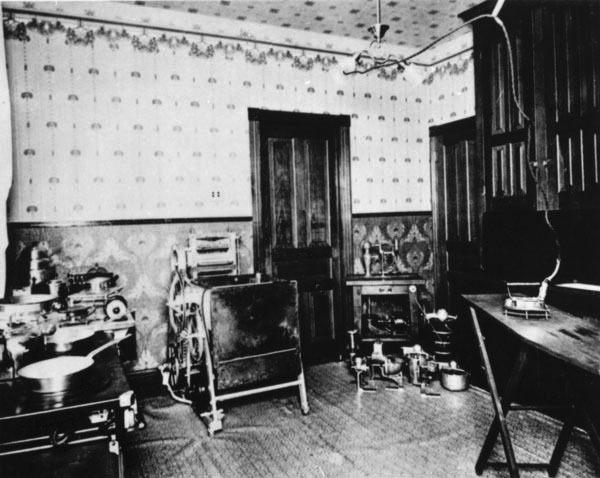 Title/Object Name: Interior of Rorabaugh Dry Goods Co. Description: Interior of Rorabaugh Dry Goods Company Department Store, 119-121 North Main.